Mandria, Paphos – Your chance to buy a small slice of one of the most exclusive resorts in the Paphos area. Aphrodite Sands is a very attractive and well managed resort on the perimeter of Mandria Village. 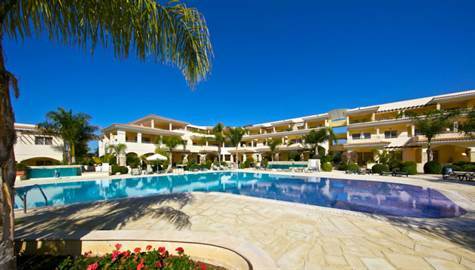 All apartments within the resort enjoy the use of two swimming pools and its extensive spa and gymnasium facilities. The small grassed childrens’ play area is a relaxed space enjoyed by both children and their parents. The tavernas, pubs and restaurants of Mandria’s village square are only a very short walk away and its unspoilt beach just a little further than a pebble’s throw. The world famous Aphrodite Hills golf course is only a 10 minute drive away with another three golf courses to choose from within half an hour’s drive. This one bedroom first floor apartment has secure entry and is located in a quiet part of the resort just a very short distance from the main pool and spa area. It has its own private balcony with views towards Paphos and a reserved covered parking space. The apartment is light and spacious and has modern fittings in both kitchen and shower room. It has been extremely well maintained throughout and is very competitively priced. The management company provide full maintenance and rental services so this property could become a good business proposition and escape to the Mediterranean!